The SWEF Technology & Innovation Award, after it was received by the KAUST delegation. Photo by Nicholas Demille. 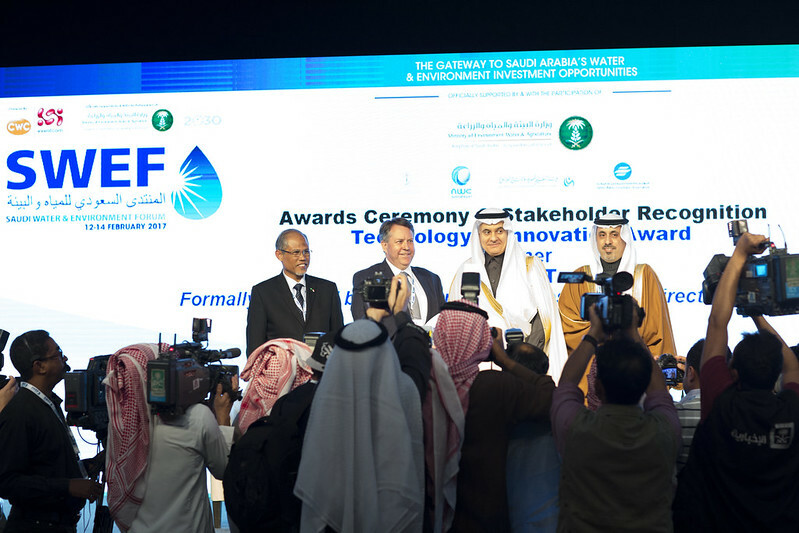 A KAUST delegation attended the 2017 Saudi & Water Environment Forum in Riyadh from February 12 to 14, where the University was recognized with the Technology and Innovation Award. Professor TorOve Leiknes accepted the award on behalf of KAUST from the Minister of Environment, Water and Agriculture His Excellency Abdulrahman Al-Fadley; Deputy Minister for Water Dr. Mohammed Al-Saud; and the Water Minister of Singapore His Excellency Masagos Zulkifli. The conference was organized by H.E. Al Fadley, and the event included a keynote address, an exhibition and a strategic conference. KAUST was involved in several key aspects. The University had a large booth presence in the exhibition hall, where Arabic and English language information was available and there were demonstrations of research from the University's Water Desalination and Reuse Center (WDRC). The University also sponsored a series of technical sessions that featured lectures from KAUST Professors Himanshu Mishra, Peiying Hong and Pascal Saikaly. KAUST speakers were involved in several panel discussions that included appearances by Professor Kim Choon Ng and TorOve Leiknes. Ng talked about a number of topics like recent advances in adsorption cooling and desalination research and the MEDAD facility in Riyadh. Leiknes spoke about the burgeoning field of urban agriculture, highlighting the need for cities to bring the production of food closer to the consumption of food as urban density grows larger and as a means of reducing costs and increasing the security of supply. "New concepts and technology in urban agriculture are emerging as a solution to provide food to a world population that is increasingly gathering in urban and peri-urban environments," Leiknes said. "Agriculture in general exerts a large demand on freshwater sources, and there is a need to find solutions for this water demand in urban agriculture. Wastewater is a readily available non-conventional source in urban environments, where new technologies and strategies are needed to meet the water demand for urban agriculture." The WDRC sponsored two days of technical sessions at the forum, with KAUST speakers at the sessions including Mishra, Hong and Saikaly. Mishra gave a talk about a new water-saving technology that he developed with a team of researchers at the University. "Agriculture consumes nearly 70 percent of the global supply of fresh water," Mishra said. "Our superhydrophobic sands dramatically reduce evaporative losses from topsoils and enhance crop yields. This strategy could be exploited for orchards." The talks gave the KAUST researchers the opportunity to discuss some of their latest findings as well as answer questions from academic peers and industry. The KAUST speakers were joined by technical presenters from Dow, UVGermi, Xylem, Bürkert Fluid Control Systems and AMIANTIT. The WDRC also sent a team of students to Riyadh to take part in the technical sessions and to speak with visitors on the convention floor. The group included KAUST master's degree students Aniela Zarzar, Joel Reihmer and Adair Gallo Junior, all three of whom work in Mishra's lab. Reihmer researches hydrophobic sand with Mishra, and he showcased his project at the booth. Moustapha Harb, a Ph.D. student from Hong's lab, also assisted with the technical sessions and spoke with industry representatives. Harb is set to defend his Ph.D. dissertation at the end of March 2017. From March 27 to 29, the WDRC will host the conference "Changing Paradigms of Wastewater Treatment: From Waste to Resource." The aim of the event is to highlight the critical role of efficient and innovative technologies and microbes to recover resources (water, nutrients and energy) from wastewater in a safe and sustainable manner. Global increases in water demand and decreases in both the quantity and quality of fresh water resources are the driving forces behind the development of sustainable water use practices. An adequate supply of safe fresh water is not only needed for drinking and sanitation but also for industrial and agricultural activities. The water challenge is complicated as it is interrelated to two other grand challenges—energy and food security; this is known as the water-energy-food nexus.